Cambodia’s second largest city moves at a slow and lazy pace. Maybe it’s the heat, but I get the sense that Battambang is like this every day of the year. People stroll down the sidewalk, taking time to stop and chat along the way. No one is in a hurry. I enjoy watching this peaceful life around me, as I sit admiring the architecture. More than a century ago the French were here, and you’ll find many art-deco style shophouses. Every building has a store of some kind at street level, a restaurant, a boutique, an art gallery, a tiny chemist, a mini-market… The higher levels, if there are any, have been made into private residences, most of which house the owner of the shop below. Shutters are on the windows, some have wrap-around balconies in the neoclassical Beaux-arts style of French design. I’m sitting at the Bric-a-Brac, a combined restaurant, boutique and B&B, and almost every building in sight is at least a century old. A few of them have been restored, with antique mosaic tile floors and ornate entrances. Many of the government offices here are housed in former private mansions. 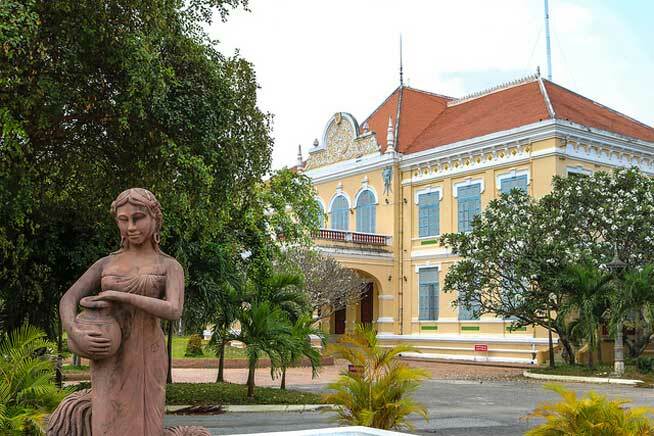 The peach-coloured Governor’s House, overlooking the peaceful Sangker River, is a beautiful example of a grand, neoclassical mansion. Beyond the mansions are a smattering of Buddhist wats (temples) that give Battambang an ancient, otherworldly charm. The sounds of monks chanting, temple bells tinkling and children laughing create a sense that in this city, everything is just fine. The multi-tiered central market, not far from where I’m sitting, is a perfect example of art deco architecture. The clock tower, which still keeps the city’s time, is an easy landmark visible throughout downtown. Most people do their food shopping at this traditional Asian market. Bargaining isn’t required here and those in the know go in the morning, when food is at its freshest. Today all I’m after is a cooling light snack, so I head over to the market and, for $1, buy a bag of Kuih—bite-sized steamed confections flavoured with coconut, nutty, fragrant pandan and palm sugar. They are a perfect accompaniment to a cool drink. I wander down to one of the parks on the riverbank to relax on a bench as I savour the flavours. If you’re after more than a sugary treat, Battambang has several good restaurants offering authentic Western food. You can also take your pick from French, Italian, Chinese, Thai, Indian and American cuisine, as well as excellent Cambodian food. At two of the nicest restaurants in town, Au Cabaret Vertand the Bambu Hotel Restaurant, a meal for two, with an appetiser and drinks, won’t cost more than $50. Most other restaurants are even less expensive, and dinner for two, including drinks, will cost $25 or less. Of course, if you eat where the local people eat, you can find cheap and healthy food for just a $1 or $2. Beer at a restaurant can be had for about 65 cents, and mixed drinks are about $5. There’s a growing expat community here, and it’s certainly clear to me why people have chosen to settle down here. It’s a social town that has left the stress of the modern world far away. Long-time traveller, Pat Music, a 68-year-old single retiree lives comfortably on her small pension and teaches English for a few hours every week. “My monthly bills come to about $400, and that’s including rent, water, electricity and internet. I buy my food at the market and usually cook at home. Going out to lunch is my biggest expense, though that usually comes out to just around $6.50 or so. I walk everywhere,” she says. The city is small enough that owning your own wheels is optional. “When I do use public transport, I take either a motorbike taxi for 65 cents or a tuk-tuk for $1.30,” says Pat. Tuk-tuks are everywhere and rarely charge more than $1.30 per person for any destination within one or two kilometres from the centre of town. Battambang is also a good place for seniors. Pat explains, “Everyone calls me grandma or grandmother, even the monks. I feel very spoiled and pampered. They treat me like gold.” It’s a hidden gem that most people coming to Cambodia never see. They’re missing out. Sign up here for IL Australia’s e-letter and we’ll send you a free postcard e-letter three times a week. We’ll also send you a FREE research report on Cambodia: A Low-Cost Kingdom of Wonder.